I read this article and found it very interesting, thought it might be something for you. The article is called New Book Release: “Fear and Faith” by Trillia Newbell and is located at https://thewitnessbcc.com/new-book-release-fear-and-faith-by-trillia-newbell/. 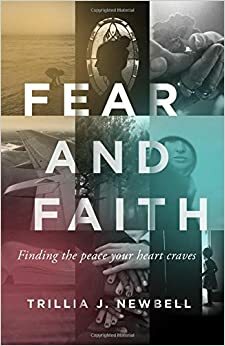 On April 1, a new book, Fear and Faith: Finding the Peace Your Heart Craves by Trillia Newbell, comes into our lives. The work arises from the author’s own experiences of enduring frightening circumstances but confronting them with faith in God. “It’s a personal testimony of the faithfulness of God in my life as well as the theology of who God is and why we can trust Him,” says Trillia. She discusses various fears like the fear of man, fear of women, fear of sexual intimacy and more. Then she talks about the character of God: good, holy, sovereign, loving. If these things are true then we can trust Him. She also talks about the fear of the Lord—what it means and how we can face our fears with faith because of God. But Trillia’s thesis isn’t simply “Don’t be afraid. Have faith.” So-called “legitimate fears” do exist. “We don’t want to trust everything and everyone. We definitely need to act with discernment. There is a healthy fear in different situations,” says Trillia. The insights in Fear and Faith are not abstract lessons or hypotheses, though. Trillia has gained wisdom through the painful circumstances through which she has persevered. “I’ve had four miscarriages, so I understand what it’s like to have a child in your womb and then they’re gone. And then be pregnant again and wonder, O God, am I going to see this baby? There is fear there, and my heart has been gripped by it.” Fear is a battle. It must be fought with faith in God. This is Trillia’s second book. Her first, United: Captured by God’s Vision for Diversity was released in 2014. Her latest work, Fear and Faith is available for purchase now. I just recently published a new 2nd edition of my book, “The Prosperity Gospel: Where Did It Come From? Gnostic Source? Or Spiritual Revelation?” by which I address the issue of prosperity gospel from a historical, biblical, and theological analysis. The most striking about the proponents of the prosperity gospel is that they give a vague, simplistic, revelational answers to complex issues (1 Peter 2:24). My book have several new chapters along with question of discussion at the end of each new chapter. At the end of the book give distinctive language that are distinguishable from historic biblical Christianity and Reformed theology. Such language of the Bible have been systematically distorted to fit within the culture context of Faith theology. A must read book.